has been in my life very personally since May 22 1992. Funny thing I didn’t have a ribbon anymore and, as I was passing a “notions” shop ( what are the chances on Madison Ave in the 50’s near Bloomies) I went in and there nestled atop all kinds of ribbons striped laced and taffetaesque was a spool of the most perfect red ribbon $1.35/yd could buy. What happened next took me by surprise. I told the counter matron that I wanted a small piece. At first quick to outline the parameters of 1 yard minimums she paused as I said I would buy the yard and take …..( I folded the ribbon around itself to form that all too familiar symbol of a pinned ribbon) . Before I could finish she clipped 4 inches and gave it to me , thanking her I said I lost a very special man 22 years ago. Without saying more she took out a pin came around the counter and asked if I’d like a pin. She folded the ribbon and placed it on my jacket lapel. Thanking her as I left I was touched by this act of kindness from someone to help me witness that I knew a man by the name of Hammett and today I remember. Xo you all and cheers to Bill. 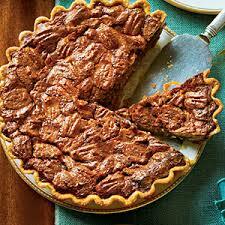 Treat yourselves to a L’ll cocktail or piece of pecan pie today -Bill would like that!